The Web of Time is stretched to breaking. History is leaking like a sieve. In the Citadel of Gallifrey, the Time Lords fear the end of everything that is, everything that was… everything that will be. The Doctor holds the Time Lords’ only hope – but exactly what lengths will the Celestial Intervention Agency go to in their efforts to retrieve something important from within his TARDIS? What has caused Imperiatrix Romanadvoratrelundar to declare war on the rest of creation? And can an old nursery rhyme about a monster called Zagreus really be coming true? Paul McGann is the Doctor in…Neverland. There are fixed points in time, events that cannot, under any circumstances, be changed or prevented from coming to pass. The “death” of Rory Williams in The Angels Take Manhattan. Rose’s dad Pete getting his by a car in Father’s Day. The freighter crashing into Earth and killing Adric in Earthshock. No matter how horrifying, how heartrending, how soul crushing these events were to the Doctor and his companions, death is the ultimate temporal fixed point. Attempting to alter the timeline to save someone’s life can lead to serious disruptions through the Web of Time. A child isn’t born over here. A war is never fought over there, meaning thousands of people will go on to lead thousands of unintended lives. A sun fails to go supernova, collapsing instead into a black hole and affecting the surrounding area of space. It begins to add up, as one thread becomes several, becoming a whole string unraveling the very fabric of time. Now, what happens when you not only take someone from their timeline right before their demise, but take them across time and space, from the 1930’s of New York all the way to the far future of lightless Cimmeria IV? When someone who is supposed to be dead is alive in both the past and the future, how would time react to this major conflict? 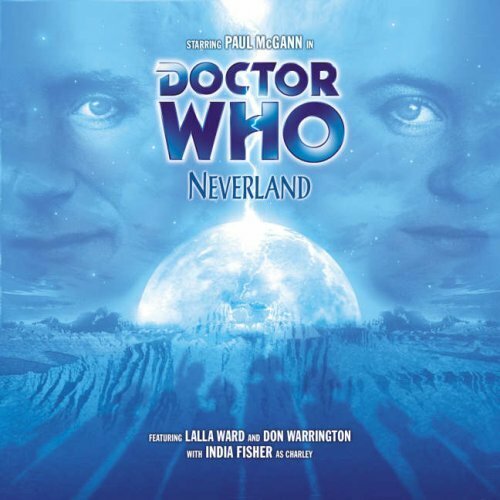 Neverland is the season finale for Paul McGann’s second season as the Eighth Doctor, and it also serves to tie up the character arc of Charley Pollard, destined to die in the final descent and fiery crash of the airship R-101 before the Doctor whisked her away at the end of Storm Warning. Over the course of the following episodes, Charley has seen Cybermen, experienced the final fate of Venice, chased a man throughout the history of Earth, and come face-to-face with the Daleks. She has also been given hints of her missed fate; ghosts in an Edwardian manner demand her death as her continued existence is unfair in the face of their demise, demons refuse her as a sacrifice to do her being already dead in their eyes, and the Daleks use her body as a source of chronos, time-travelling particles, in an attempt to fuel their time machine. Little snippets of the Web of Time have been spaced throughout previous episodes, such as a mention of President Benjamin Franklin or Orson Welles never hearing a famous line from Shakespeare. And in the background, almost as a throwaway, snippets of an old Gallifreyan nursery about a creature called Zagreus, foe of Rassilon. Both Paul McGann and India Fisher deliver some of their best performances in their time with Big Finish, but add in Lalla Ward as Romana and a strong supporting cast, along with a script that suffers from very little bloat and an intriguing plot. The clues have been laid out and the seeds have been planted through the previous audios, and Neverland is a season finale that pays off the proverbial prep work. Back in the Time Vortex after the events of The Time of the Daleks, the Doctor has a surprise for Charley – a VIP pass for the most exclusive party in the galaxy. He’ll just drop her off for a year and be right back to pick her up. The sudden appearance of a Battle TARDIS flotilla, however, causes the Doctor to attempt evasive maneuvers. Charley knows the score, however. The Time Lords have finally caught up with her, and outside of the TARDIS door is her fate. Thanking the Doctor for the extra months of her life, Charley uses the Fast Return switch to put the Doctor’s TARDIS in the path of the Gallifreyan time torpedoes. When the Doctor comes to, he’s greeted by President Romana. Time has begun to leak like a sieve, with ripples rapidly spreading across the universe like a virus, and Charley is Patient Zero. If time exists, then so must anti-time. The Eye of Harmony, the source of positive, infinite time has its own shadow, in another universe. Charley, due to her unique state of existence, is a bridge between our universe and the anti-universe. The Time Lords don’t plan on killing Charley; they plan to use her to travel to the anti-time universe and eliminating the threat of anti-time before it can take root in our universe. Anti-time is a place where comets eat their own tails, where a star swallows a star swallows a star, where a black hole can go supernova at anytime. And it is a place where Zagreus, a monster used by Time Lords to scare their children, is said to inhabit, banished and defeated there by Rassilon in the Time Lord’s last great act. There is only one place in the universe where the Time Lords’ sensors and instruments will work; a jagged planetoid with stalagmites stretching into the air, where the begins who inhabit this forsaken universe, the Neverpeople whisper threats against those from the outside. But they don’t want to destroy our universe, simply to “sip” on it on occasion to quench their endless thirsts. And in return, they have something to offer, something that will shake Time Lord society to the very foundations. One of my biggest complaints in recent reviews has been that some of the scripts have had too much plot crammed into them. Large, grandiose ideas that sound good on paper, but when put to audio risk getting lost in the shuffle or becoming ensnarled in a plot-sized Gordian knot. Alan Barnes, the writer of Neverland, also penned the first Eight/Charley story, Storm Warning. He opened up the story arc, and here he gets to close it. We have the Time Vortex, we have Gallifrey, we have the anti-time universe…there is a LOT going on here, and to Barnes’ credit, he never gets bogged down in the details. There are barely any wasted scenes or words, and the numbers of simultaneous plots is kept to a bare minimum, which allows them to fully develop without strangling each other in the process. And it’s a good thing, too, as Neverland clocks in at 140 minutes; two 70-minute episodes, back-to-back. Barnes manages to keep the story moving and the main plot at the forefront, along with more than a few twists and turns along the way; the mid-serial cliffhanger and the revelation of just what the Neverpeople are make up just two examples. The script is complex, but Barnes allows for the listener to follow along without getting lost in the weeds. Over the course of two seasons, Charley Pollard has come a long way, and a large round of applause must go to India Fisher for her performance as an “Edwardian Adventuress” over that time. Wanting to see the world, she’s seen much, much more than that, but she also realizes that nothing last forever. The Doctor rescuing her from the R101 was a blessing, and all those extra days were a gift. But, and with a title like Neverland, the following metaphor shouldn’t come as any surprise, it’s time for Wendy to leave Peter Pan behind. Twice during the serial she tells the Doctor to sacrifice her for the greater good; once when she puts the TARDIS back in the path of the time torpedoes, and again during the second episode, where Fisher is screaming for the Doctor to go through with it. When he refuses, her response is a resigned “I hope you can live with yourself.” In an TV era with more…”self-centered” companions…Charley’s willingness to sacrifice herself and her disappointment at the Doctor are a punch to the gut of the listener, and bodes that major changes will be coming to her relationship with the Doctor. But there’s another role that India Fisher plays in this serial. As seen at the end of Seasons of Fear, there’s an anti-Charley running around. Sentris, the “leader” of the Neverpeople, has taken human form with Charley’s likeness. A little lower voice, a little after-effect in the audio, and India Fisher makes Sentris CHILLING. The reveal of how Sentris became a Neverperson, along with the rest of them, will send a shiver up your spine, especially when one realizes just how many Neverpeople there are, and why they all have a right to be vengeful against the Time Lords. Lalla Ward makes her second appearance as Romana, Lady President of the High Council of Time Lords. Where in The Apocalypse Element she was twenty years a prisoner of the Daleks, in Neverland Romana is in charge, and clearly disappointed; of all the billions of sentient beings in the universe who could be responsible for the Web of Time unraveling, of COURSE it had to be the Doctor. Ward plays Romana as conflicted, yet determined. The Doctor tells her not to harm Charley, but her advisor Vansell reminds her of the possibilities should the Web of Time fall apart. 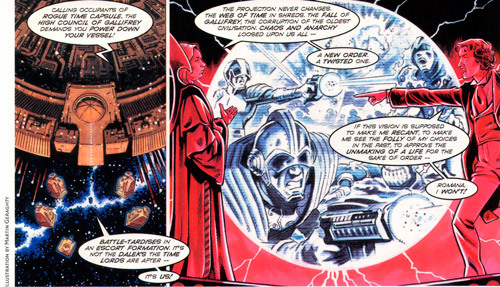 Romana shows the Doctor an alternate Gallifrey; Imperatix Romana, surrounded by the heads of Sontarans on spikes, ordering the genocide of the Daleks in the name of the Empire of the Time Lords. As President, even the Doctor gives her a measure of respect, so proudly does she wield the authority of the office. Romana is bold, brave, and will do what is necessary to save Gallifrey, unless it means killing an innocent girl. You can sense the difficulty of saving the entire universe being weighed against putting to death Charley, who only wanted to live a bit longer. Even though Charley agrees that her sacrifice would be for the best, Romana still refuses to consider it, relying on the Doctor to somehow, as always, save the day. There’s a great part in the anti-time universe between Romana and two Neverpeople that would risk giving away a major spoiler, but it’s absolutely heartbreaking to hear the proud Romana reduced to anguish over the situation. Anthony Keetch, as Vansell, is the head of the Celestial Intervention Agency and was previously heard in The Sirens of Time and The Apocalypse Element. He’s ambitious to a fault and never got along with the Doctor during their time on Gallifrey. Keetch plays him as someone loyal to the idea of Gallifrey and the office of the High President, and not necessarily to Romana herself. His actions over the course of the story are a mix of both personal ambition and for what he feels is for the greater good of Gallifrey. Keetch pulls off a core rule of being an antagonist without overdoing it and chewing the scenery in the process: being absolutely convinced you are in the right. And what of Paul McGann? I’ve noted over the course of McGann’s run as the Doctor that as opposed to the grand plans and long schemes of Seven, the eighth incarnation of the Doctor is quick on his feet and lightning in mind, improvising with the best of them even as he leaps first and says to the devil with the questions. Even as his plans to save Charley go to hell, he refuses to give up. McGann’s Doctor is a Time Lord of action and deed, whether he’s trying to solve a puzzle, piloting the TARDIS without instrumentation, or threatening Vansel, Romana, or the Neverpeople should something happen to Charley. And his final gambit to save Gallifrey is one that involves him soothing and apologizing to the TARDIS, referring to her as the “old girl” as other Doctors always have in a quiet and endearing manner. People talk about the friendship between Nine and Rose, or Ten and Donna, or Four and Sarah Jane. Eight and Charley have the same friendship, McGann and Fisher showing amazing chemistry in the process. Near the end, the Doctor yells out that he loves Charley. Now, some people, especially modern day fans, would freak the hell out at this point, but the listener, having been with the pair since Storm Warning, realizes that it’s a love based on friendship. “Love” is a word rarely used in Doctor Who; it’s always been unspoken, but the bonds of deep friendship are there with every Doctor. Kudos to McGann and Fisher for managing to pull off the rarest of feats and making that love believable. This entry was posted in Big Finish Review and tagged Big Finish, Charley Pollard, Doctor Who, Eighth Doctor, paul mcgann, Romana, TARDIS. Bookmark the permalink.